In February of this year it was reported that a new and controversial plan was being considered for the redevelopment of Flemington’s historic downtown area. While the proposed plan is still far from finalized, if passed it would include a new hotel, hundreds of condo units, retails shops, a parking deck, and a six-story building that the developer hopes would house a college or professional school. 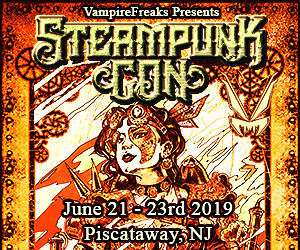 The plan would also call for the demolition of the landmark Union Hotel, which is famed not only for its significant roll in history, but also for the many tales of its supernatural inhabitants. UPDATE: After years of efforts by activists and preservation experts to save the Union Hotel, made famous for its role in the Lindbergh baby kidnapping trial, the borough announced Friday it has struck a deal to preserve the landmark building, according to a May 12, 2017 article posted on NJ.com. Changes in the project and market conditions created the opportunity for the borough’s Redevelopment Committee and redeveloper Jack Cust, Jr. to revisit the plan and preserve the 19th century hotel, it was announced in a statement. 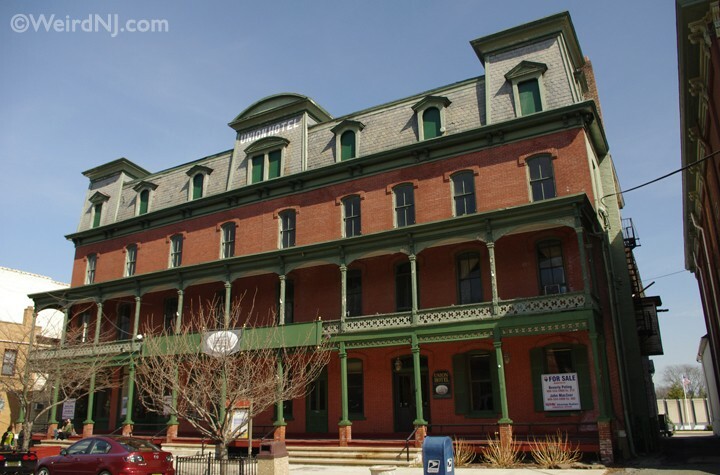 Built in 1878 during the Victorian Era, the Union Hotel, with its red brick façade, French-style mansard roof, and wide two story tall porch, has been a centerpiece of Flemington’s Main Street ever since its days as a stagecoach stop. In 1934 it stood witness to the media event that was dubbed the “trial of the century,” when Bruno Hauptmann was accused of the kidnapping and murder of Charles Lindbergh’s infant son and tried at the courthouse right across the street. The hotel’s 52 rooms became the base of operations for scores of world-renowned journalists, as well as a temporary home to the sequestered jurors. 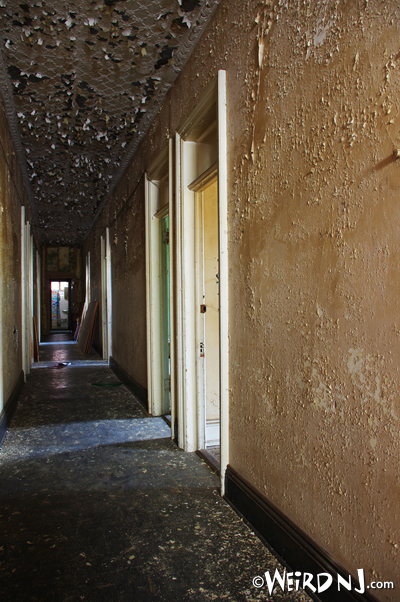 Though the grand old hotel ceased taking in overnight guests back in the 1950s, there are still said to be some lodgers who have never checked out. 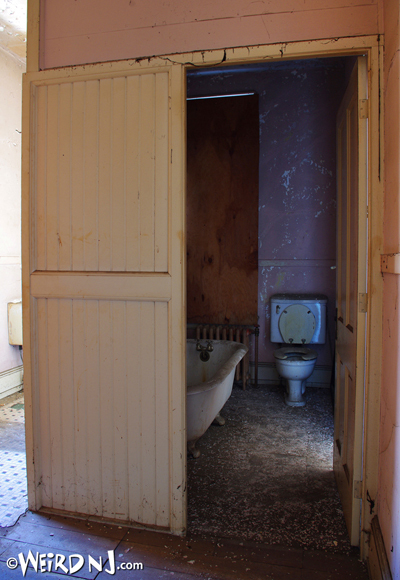 A few years ago Weird NJ was invited to tour the vacant rooms and empty corridors of the Union Hotel, which have been sealed off from the eyes of the public for decades. 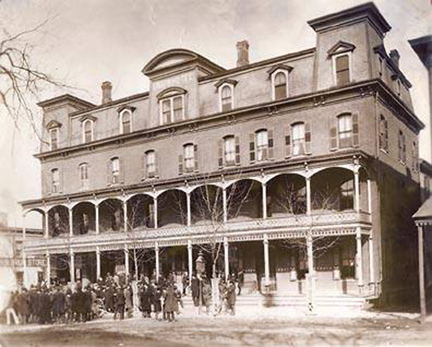 In its most recent incarnation, the Union Hotel operated as a bar and restaurant. A former manager (who asked to remain anonymous) told us that one night after closing a bouncer locked the front doors then returned to the bar where a few of the staff were sitting around having a drink. Suddenly the locked doors flew wide open and a cold wind swept past them. When the bouncer went back out to reclose the doors, he saw a disembodied pair of children’s black patent-leather shoes walking up the main stairway. He freaked out and ran across the street. He then called his fellow employees on the phone and told everyone to get out of the hotel. Another time, the manager recalled, one of the waitresses was carrying a register drawer upstairs to the office. When she reached the top of the stairs, she heard an unearthly voice humming a lullaby. She dropped the drawer full of money right there and ran out of the building and never returned. 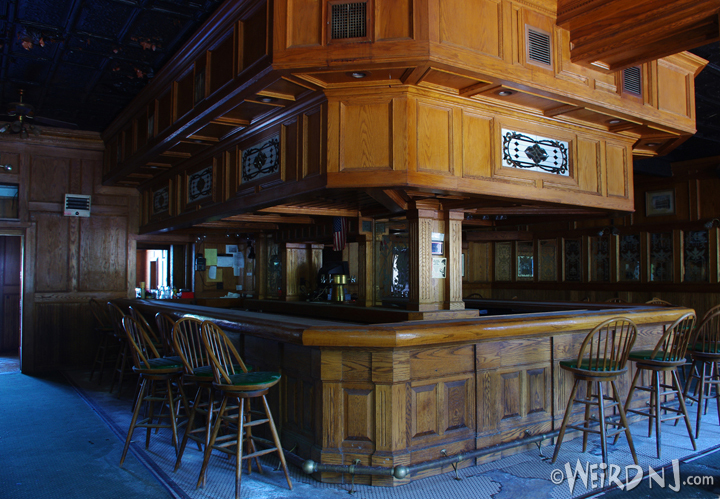 The Union Hotel finally closed its doors to patrons in 2008. In the years that followed a new group of investors purchased the property with the intention of restoring the hotel to its former glory, being as historically accurate as possible, and then reopening it to the public. 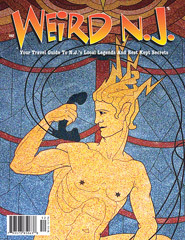 Weird NJ met with one of the new owners at the time, Joe LoPiccolo, and he took us on a tour of the long abandoned parts of the hotel. The vacant second and third floors have now been closed since the late 1950s, except for two rooms that were used as office space during the bar/restaurant days. 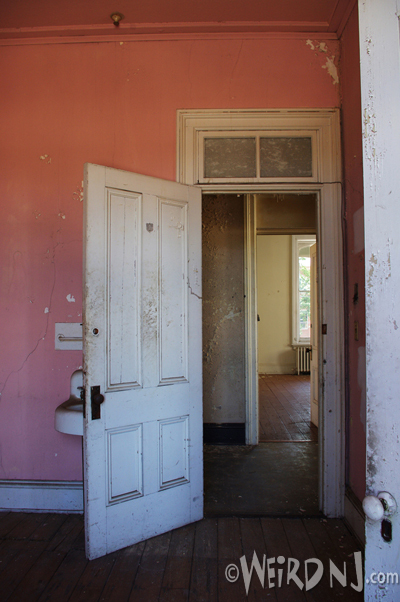 The place truly looked haunted, inside and out. 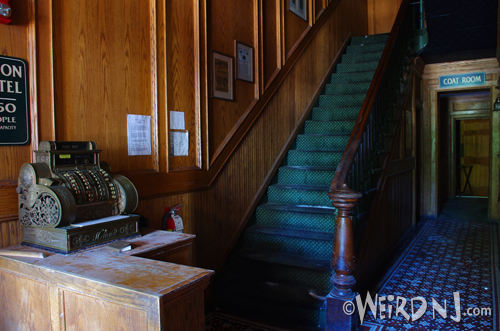 The recent years of neglect had made the Union Hotel a perfect backdrop for the re-telling of paranormal events that have happened in the 138-year-old building. Not more than a few minutes into our conversation, the heavy back door we’d entered though and had left open slams shut with such ferocity that it startles everyone in the place. 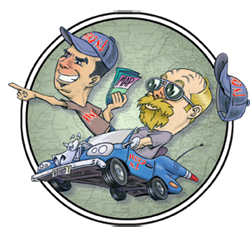 Unfortunately, the plans of Mr. LoPiccolo and his investors for the renovation and reopening of the Union Hotel never came to fruition. The new proposal being considered, which is spearheaded by local entrepreneur Jack Cust, Jr., calls for the razing of the grand old hotel. But the plan currently on the table is not without its opponents, which include historic preservation groups and a prominent local architect who says that the Union Hotel can and should be saved. The debate continues in the local press and at Flemington town hall meetings. Meanwhile, back in the dim and deserted corridors of the Union Hotel, a visitor can easily imagine what it must have been like during the media circus of the Hauptmann trial––not much has changed here since the 1930s. 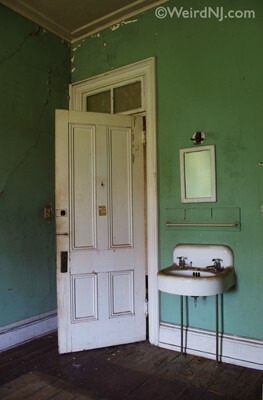 The guest rooms on second and third floors have not been rented out for well over a half a century and remain frozen in the past, looking just as they did when they were first closed to the public. The rooms are small, and for the most part, completely empty. Paint is peeling from the ceilings, mold is seeping through the carpets and mildew stains the walls. Creaks and other unidentifiable noises come from every direction and echo through emptiness. One can hardly help but think of the Overlook Hotel in Stephen King’s novel, The Shining. If there is a more accommodating residence for a specter to inhabit throughout all eternity, we haven’t yet seen it. All that may soon change though, if the developers have their way, and the resident spirits of the Union Hotel may have to finally check out and find another haunt to call home. 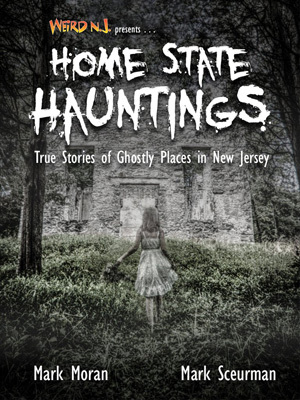 This entry was posted in Abandoned, Garden State Ghosts, Stories and tagged abandoned, Bruno Hauptman, Charles Lindbergh, Flemington, ghosts, Haunting, Hunterton County Courthouse, Kidnapping, Union Hotel. Bookmark the permalink.